Before my first visit to Spain, I had been warned of the racial prejudice that exists here. I ignored those warnings. Even though it was proven to be true a few times, I never had any regrets about studying here which is why I came a second time to intern with Adelante Abroad. I could have looked at those negative experiences as a reason to never come back, but I didn’t. Instead, I chose to come back and focus on furthering my career and seeing the world. Through all of the negativity that I have experienced here, there are so many aspects of Spain that are beautiful and many people who do not have that same mentality. It took me some time to realize that immigration is relatively new to Spain, the surge of immigrants from Africa, Asia, and South America only began in the early 2000s. Of course, this doesn’t excuse any racial bias, but it has allowed me to better understand where these people are coming from especially the older generations. When locals ask me “Can all black people sing and play basketball?”, I know not to immediately get offended, but to use that as a teaching experience. Showing them that the things on T.V. aren’t always accurate. Like how Spanish people don’t always siesta and dance flamenco all night. I’m hoping that whoever reads this blog and is second-guessing whether or not they should come to Spain (or travel anywhere else) for fear of racism, will really think if they want the ignorance of other to get in their way of seeing the world and pursuing their dreams. Coming back to this country that I love, even with its imperfections, has been one of the best decisions I’ve ever made. Chynna P. is an Adelante Abroad candidate from Northeastern University. Chynna was an Environmental, Horticulture, and Ecology Intern in Madrid, Spain. Interested in interning abroad like Chynna? Visit our Intern in Madrid page and learn about the different sectors we offer. Where do I start? Sevilla was absolutely beautiful! I’m grateful for the opportunities and experiences I’ve had here with Adelante Abroad since starting as an intern this summer. We explored Sevilla the way a candidate would experience traveling abroad and it was phenomenal! Unfortunately, time flies when you’re having fun. I can honestly say I left hoping that one day I’d be able to go back and become a candidate with Adelante. Sevilla is definitely the perfect destination to intern or study abroad! The streets of Seville are filled with colors and the neighborhoods have fascinating architectural styles. It was mind-blowing! It would take a minute to sink in just how beautiful everything was from left to right. Every building, street, or business looked like it came from a perfect picture. From left to right, top to bottom, the view was breathtaking. Sevilla allows you to forget about all of your problems and be filled with wonder as you walk down the street. I can’t express how fulfilling this experience was. Stepping outside of your comfort zone may sometimes be scary but in the end, you’ll be glad you did. Sometimes you have to go for it and it’s not every day that you get an opportunity to do so. Every day was a new adventure, to visit a new place and explore life in the streets of Sevilla. Getting around was extremely easy, walking distance was fairly 20 minutes or you could use the metro line that was not confusing at all, compared to LA and all the traffic. Getting lost through the streets of Seville turned out to be the best adventures. Right around the corner from our apartment, there were many places to eat tapas and have a cold beer, and roughly with a 10-minute walk, you would be able to go the historical structures and wonderful places. Everyone in Seville is really kind and welcoming! Whether it was to go out to grab something to eat or explore the city, people would greet you and offer to help. One time as I stopped by the Plaza Jesús de la Pasión for some ice cream and crepes, the gentleman there began a very pleasant conversation and even offered some recommendations. Of course, the Spanish Institute team in Seville was beyond sweet and welcoming, as they showed us around some must-see sites of the city. This experience was definitely one of a kind and of course one for the books! It opened my eyes and soul to more than I imagined (across the world to say the least). There’s so much to see and live outside of our daily routines and local destinations. Since there are days that we become so immune to what is happening around us, a quick breeze outside of our daily routines and comfort zone is necessary to appreciate the smaller things in life. For me personally, the small things are what make you feel, live, think and understand new things. Because at the end of the day it’s those experiences and memories that you create that you will cherish in life. There’s a whole world outside of your window waiting to be explored! So thank you Adelante Abroad for this one in a lifetime experience and, Sevilla, I promise I’ll see you again soon! If you’re interested in traveling and interning in Sevilla, check out the Sevilla page where you can find several sectors that are popular and more! Thinking about applying to intern abroad Spring 2019? It’s not too late! 1. Passports must be valid for at least 3 months after your planned departure date. You may be denied boarding and/or denied entry to any of the 26 European countries in the Schengen area. Make sure you’re not left behind! Regionalism and religious topics are very sensitive for Spaniards. Avoid swearing and using God’s name in vain, it may offend the people around you. 3. Catalonia has its own language and culture – They really take pride in their own language and culture, again be cautious about bringing up regionalism topics. 4. Don’t even think about walking around the city streets with a swimsuit. It is illegal in cities like Palma de Mallorca, Malaga, and Barcelona. Unless you are on the beach or surrounding streets, you may end up with a fine! It’s not worth the Instagram post… make sure to bring a cover-up. 5. DO Dress accordingly- If you are visiting a sacred place, a monastery or church make sure to dress accordingly to avoid any trouble. Spaniards follow seasonal fashion rules! Leave those shorts back home if you’re planning to go during winter. 6. DO Learn about their culture- Myths and beliefs they have, like not passing the salt shaker from hand to hand. According to Spanish belief, it is bad luck to do so! Don’t forget to leave a cactus on your window, it will ward off evil spirits from entering your home. 7. Friday the 13th? Nope, it’s Tuesday 13 – Don’t even think about leaving bed. 8. Don’t expect dinner before 9 PM. Don’t plan to have dinner before 9 PM, restaurants won’t open before. Trust me, you don’t want to be THAT person. 9. Be patient, don’t rush! Expect to wait 15 to 30 minutes. Spaniards typically are not strict about punctuality so, if you’re running a bit late, relax! DO take your time. 10. El Coco- Who hasn’t heard about hundreds of stories about the Boogieman? In Spain, children refer to the Boogieman as ‘El Coco’, the terrifying creature that eats or kidnaps kids who misbehave. According to legend in the 20th century, ‘El Coco’ was Francisco Ortega, El Moruno, who was sick of tuberculosis and was told the cure was to drink children blood, so he did, by kidnapping a 7-year-old boy. Don’t leave your naughty children unattended. At the end of the day, make sure you make friends while abroad. They might give you a few tips that are hard to find on the internet. If you’re interested in interning abroad in Spain, read more on Madrid, Barcelona, and Seville. I am currently wrapping up my two months in Uruguay and it’s left me with so much knowledge of the language and the culture of the area in and around the Rio de La Plata. I often have thought that I adjust very well to new environments, but my first few days here were overwhelming without a doubt. The weather change, the language, learning the city, and just learning how things are done in a culture takes time, but I wish, looking back, that I hadn’t been so timid. I felt like everyone was watching me when I went out and I was so afraid of taking a wrong step so it took me a while to get in the habit of getting out and about regularly when in reality, there was nothing to be afraid of. The people in Uruguay were very welcoming, I was lucky to make a friend that spoke good English who showed me around the city and I found the culture to be very relaxed. My Uruguayan friend uses the phrase “Manejate” to describe the culture here, which more or less translates to “Suit yourself”. Uruguayans are very relaxed and friendly so if you’re considering an excursion here, I would highly recommend it. The professors who taught my classes were extremely helpful and friendly and I met many other international students at the school who I became very close with. All the advice you hear about these types of trips is true, the sooner you get yourself getting out and meeting people, the better your experience will be, but it’s easier said than done. I have taken so much from my trip here so far beyond my internship and I would recommend it to anyone considering such a trip. Cheers from Uruguay! If you’re interested in interning abroad in Uruguay like Nathan, check out our Uruguay page. Ahh. Barcelona. How I miss you so. If you’ve ever been to Barcelona, you’ll understand the beauty and warm feeling you get while staying there. There is something about Barcelona that keeps me wanting more. So, in order to persuade you, the reader, I’ve compiled a list of recommendations on what to do in Barcelona. 1. Spain has naptime (siestas)! Who doesn’t like nap time during the weekday after lunch?? Although, in modern times, siestas have become less and less popular with most people just skipping it entirely. It’s sad considering college students live off of naps, but that’s the adult world for ya! The beaches in Barcelona are to die for. Warm water, nice sand, great views, beautiful people, with good food, and good drinks! C’mon, doesn’t that sound like paradise? Then if you’re hungry, tired or want to go shopping, just take a nice walk through the alleys of Barcelona! The wonderful thing about Barcelona was the narrow alleyways full of shops. From antique to modern, art to stationary, whatever you’re looking for, you’ll find. And if the alleyways aren’t your thing, head to the main streets of La Rambla and you’ll find plenty of goodies there. La Rambla is a huge tourist attraction and if you go, you’ll know why. Looking for something else? Check out this list of places to shop. Like futbol? GOOD! FC Barcelona is the primary team and have some of the best players in the world. So don’t worry, each game will be an exciting one. Ticket prices vary, depending on the season, team, post season, etc. Just be prepared for some good times, shouting and the occasional drunk person strolling through. The nightlife in Barcelona was crazy. There are people all over the world in the city who are there for work, leisure, students, international students and backpackers. For example, I found an Irish pub in the middle of a busy street and when I walked in I was surprised to the see the diversity. If you’re going to Barcelona, I would suggest going out at night! It’s a great time and everyone is out! If you’re looking to getaway for the weekend or just want a relaxing day, it’s easy to get around and it’s easy to find a coffee shop to people watch. Barcelona is a beach city and you can travel along the coast to other towns or fly to Madrid for the weekend. Whatever you choose to relax and unwind, you will find it. Whether you find that one special coffee shop or a means of transportation to a neighboring town, you will find whatever you need in Barcelona. Just make sure you enjoy the journey! If you’re a fan of live music, there is plenty of good spots just for that! Personally, I haven’t been to any live music venues or hotspots and I regret doing so, but that doesn’t mean you should miss out! Finding live music isn’t hard, all you have to do is listen. But if you’re looking for a more specific genre, this list will be a good place to start. Regardless of what you choose to do in Barcelona, it’s a wonderful city that has activities for anyone looking for an adventure. The activities I recommended were things I’ve done or wished I had done and are must do. Happy Siesta! Traveling alone can be terrifying and it definitely takes some time to adjust. Without a doubt, you will have anxiety when you’ve landed in your destination and off the plane. Don’t worry, you’ll be fine! Traveling gives you the opportunity to grow as an individual and as a global citizen, so any opportunity to travel is a #blessed one. So, whether you are or you will be traveling alone, that’s awesome! I understand the fear, hesitation and, yes, the anxiety, I’ve been there. Don’t let that stop you from enjoying your time abroad, especially when you’re alone! Traveling alone is the best. Your comfort level, communication, patience, budgeting and other skills needed when traveling all become amplified and improve. This is where you are truly tested and pushed to your limits, but those limits that held you back start to diminish. You’re growing. That’s one of the key things you take away when you travel alone, you grow. You learn so many life skills and you meet so many more people when you travel alone. You are almost forced to be more social, extroverted and more open to the people around you. I always suggest staying at a hostel because that’s where you will meet people doing the same thing you are doing! Hostels are a communal area and that’s the point, so you can meet other travelers. As always, BE CAREFUL and BE SAFE! Whether you’re a man or a woman, you must always make smart decisions and to trust your gut. If you think walking down that dark alleyway at 3 am coming back from a bar or a club is a “good” idea, think again! Be smart. You’re alone in a country that may not speak your native tongue, have an embassy or a hospital within a reasonable distance. Recklessness will not be tolerated abroad, especially if the laws of the land are strict. Regardless, traveling alone is a huge step toward independence and self-improvement. YOU make the most of your trip, not anyone else. You’re there for a short period of time and you should take advantage of the opportunities being presented to you. There will be many, I promise. Take a deep breath, then go. Be smart. Be safe. Have fun. It’s called Google, joking. But not really, you can use Google to find your answers about weather and all the logistics of the place you’ll be headed to. It is best to plan ahead but checking weather or the seasons depending on where you’re going. Remember, winter in the Northern Hemisphere is summer in the Southern Hemisphere. It’s flipped! I’m here to help you decide, plan and maybe even remind you on what you should and shouldn’t bring with you abroad! Now, before I get started, I just want to point out that I am a man. I don’t know really know logistics to how women pack, so this is very broad overview of travel essentials. Bare with me. You’re more than welcome to print this to use as you begin to pack! I would like to point out that this list is based on either a short (one to four weeks) or long (10+ months) period of time. It just depends on how you travel and the list is based on how I would normally travel. Assuming you will do laundry and potentially purchase clothing/souvies abroad, will explain the limited amount of clothing. Shirts (2-4) – I say you would only need 3 since four is pushing it, but I digress. Pants (1-2) – I usually wear a pair on the plane, but these can also be bought abroad. PLEASE NOTE: if you’re an American looking to buy Levi’s or any other American brand abroad, expect to pay a little more! Shorts (1-2) – Depending on where you go and the season, this number may change. Check the weather! Sports gear (1-2) – I sleep in shorts, so I bring an extra to sleep and workout in. Swim gear (1) – Unless you’re planning on going to Bali or Maldives, you will only need pair of swim gear. If not, bring one or buy one. Socks (2-4) – Please buy more socks…and/or wash your current ones. Undershirt (1-2) – I don’t really wear undershirts, but you will if you’re traveling for work abroad. Tank tops (1-2) – It really depends on where you’re traveling to and the season. Hoodies (1-2) – I’m a hoodie type of person, so I like to bring two. Cozy. Jackets/Windbreakers (1/1) – Depending on the season, you may need more or none! Hat/Bandana (1/1) – I like to bring one of each. Both will come in handy. Laptop – Assuming you’re going to travel for an internship, you’ll need this. Also nice to use for blogging or research things to do in a city you’ve never been to. Phone – Just don’t lose it…or buy an unlocked one for cheap! Chargers for all devices – yes, don’t forget this. Muy importante! But you can also buy it abroad, but you may pay a little more! Adapter/Converter for outlets – Also muy importante! These are cheap on Amazon. Voltage conversions differ from country to country, so don’t be alarmed if your hair dryer is working at half power. Tripods/Stands – I’m not talking about your $100 tripod for your $5k camera. I’m talking about a selfie stick or a GoPro stick. These are small and can be tucked away in a checked bag. Just be sure to bring only what you NEED (if you’re not going to use a tripod, then don’t bring one). Toothbrush – you can also buy this too but if you have an electric one or a fancy travel one, then by all means. Contacts – If you wanna be cool in the day and nerdy at night…? Make sure you have extras! Contact solution – To look cool in the day?? Contact solution can be bought abroad as well, unless you’re going somewhere with less medical access, then bring a bottle just in case! Hair brush – You don’t reallllly need this but unless you have a specific comb or brush. Cologne/Perfume – Not necessary unless you’re going to be fancy pants abroad or you like cologne for work. Face cream – If you have a special face cream for your skin? This would also be considered sunscreen and shaving cream! Feminine Hygiene Products – Ladies… be sure to pack ALL essentials, even necessities like *cough* pads, tampons, etc. Health-related items – Medications, epipen, etc. Make sure you have enough if you’re going for a short period of time. Don’t risk it. Travel journal – I highly recommend! It’s a great way to relax, take time to for yourself and to really think about your journey thus far. Backpack – If this isn’t an obvious item to bring then I don’t know what to say. You can also buy a backpack abroad! A cheap one just to hold your things. Reusable water bottle – SAVE THE PLANET. RECYCLE AND REUSE, BUT IN THIS CASE, REUSE. Sunglasses/glasses – To look cool in the day and to look nerdy at night. Unless you always need glasses on then…you cool all day, every day. You can always buy some cheap pair of sunglasses abroad. Jewelry – But not too much! You may risk losing a precious gift, or worse…be a victim of theft or pickpocketing. Copies – Passport, credit card info, health insurance and other important documents you may need to get back into the country or to an embassy. NEVER carry your passport, lock it up and/or leave it at home. You should carry a copy around with you instead. Always have some form of identification on you no matter where you go. Sometimes, the things that you love and adore at home might not be the best “travel buddies” for your next trip. For good reason, it can weigh you down or you simply don’t need it. Here is a list of items you should NOT take with you while you travel abroad. TOO MUCH CLOTHES – Seriously, if you bring too much you’ll only regret lugging it everywhere and if you run out of room for stuff you buy then you’ll have to purchase more luggage. No bueno. Pillows – NO. Just, no. UNLESS it’s a neck pillow then those are a god sent creation for any level of transportation. Bed linen – Unless you’ve got an allergy of some sort, then buy one you can dispose of abroad. Just in case you need more room in your luggage for when you come home. TOO MANY SHOES – You can buy more shoes. Depending on where you go and the time frame, the type of shoes you bring will vary. Summer in Australia? Sandals and walking shoes. Winter in Amsterdam? Boots n socks and boots n socks. Bulky electronics – Face it – even at home, you don’t need 2 smartphones, a tablet, 2 laptops and a desktop. So why would you bring those abroad with you? Not only will this be a hassle while going through checkpoint security at the airport, but it’s also a huge target for theft and pickpocketing. Sometimes, you’re better off keeping your electronics at a minimum and leaving the rest safe at home. Bath/Shower necessities – You can buy a lot of bath products wherever you’re going. Don’t waste your luggage space and weight limit on toiletries you can buy abroad. Weapons – If I need to tell you this and you double check yourself…don’t be on my flight. SAFE SPACE. Expensive items – if your clothing or anything you’re planning on bringing abroad has a price tag of more than $50 (excluding tech gear and shoes), leave that sucker at home. Things you find valuable or if you’re concerned about bringing a certain item, leave it. Not worth it losing something that either cost you a leg or has a special meaning to you. Now that you’ve seen my list of things to bring abroad with some recommendations, all you have left is to get going! Regardless of what you bring or how you pack, your trip is going to be amazing and take all the opportunities you can get! Don’t be that person who hesitates in doing something and then regrets not doing it. Live your best life! Make your Instagram, Facebook, Twitter, Tumblr, Reddit, YouTube and any other social media platforms you use look hot, fresh and aesthetically pleasing. Make your followers jealous of your travels! Be smart. Be safe. Go explore. Drew is Adelante HQ’s Social Media & Marketing intern for Fall 2017 and is currently a Public Relations major at Cal State Long Beach. He has participated in a youth exchange program in Dakar, Senegal and an international basketball tournament in Japan. One of his many traveling goals is to step foot on every continent on this big blue planet, and yes, even Antartica. 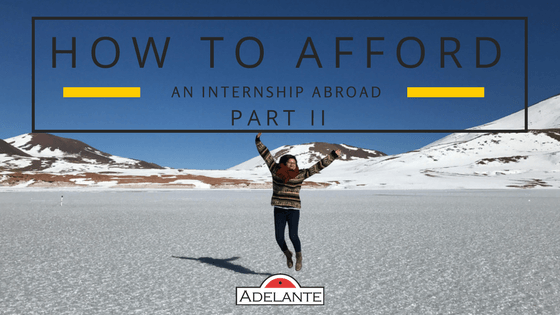 This is a two-part series to help you save and earn some extra money for your internship abroad trip. Part I has tips on saving money for your trip with your current job or cash flow. Part II includes tips on earning extra money without picking up three jobs and sacrificing your studies. We highly recommend reading Part I first to get an idea on the budget you may need for your internship abroad. If you’ve already set up a budget and are saving money, but you’re looking to earn more money toward you’re trip, then Part II is the best place to start. So you’ve successfully planned out your internship abroad program and know what it’s going to take to make it happen. This is a big step and shows your commitment to your goals and dreams! However, if you’re still struggling to find enough money for your trip (even with the money you’re already saving), there’s a couple tips to help you earn money toward your travels! If you don’t want to bite the bullet and ask your Uncle Scrooge to help pay for your intern abroad program, then there are several other ways to low-key ask family and friends (or even your school) for money. Fundraisers no longer have to involve lemonade stands or hot (and awkward) car washes. While they are still up for grabs (just because it’s old school doesn’t mean it won’t work), funding for trips in the digital era is no longer a hassle. Crowdfunding is a great way to gain travel fund money with both local and distant friends and family. Sites like FundMyTravel and GoFundMe are well known for travelers and college students trying to fund their intern abroad program. The wonderful thing about FundMyTravel is that the creators of this platform understand what it means to fundraise money to travel, study or intern abroad. They’ve been in your shoes and they create content specifically for those in are in the same boat. By creating blog posts tailored to those searching for tips, tricks and answers on how to fundraise money for travel, it sets the potential traveler up for success. Whereas GoFundMe is more of a broader spectrum for fundraising, GoFundMe is a great place to start; however, because it’s so broad, we would recommend looking at FundMyTravel first. Go through FundMyTravel blog and look for help or suggestions on how to create a successful campaign for your travels. Both platforms are actually quite similar than they are different, both take 5% of your earnings toward Administrative fees, you can put pictures, information and your fundraising goal. You can also share your links on all social media as well as email, letting everyone online know about your trip for both platforms. For the purposes of traveling, we suggest FundMyTravel. It’s more travel-friendly and you have a team who has been in your shoes and knows what it takes to travel, intern or study abroad. If you or a generous friend are creative and artsy, then you can create a t-shirt campaign through Bonfire. This is a great way to fundraise with donations without any startup or inventory costs that you would have to spend elsewhere. Your friends and family will also receive a shirt with your awesome design on it that they can wear for years. Start talking to family and friends before your campaign goes live. Prospective donors who see that you’ve already begun funding before you opened your campaign are more likely to help chip in. Write about your plans when going abroad, where the funds will directly go toward, and why taking an internship abroad is important to you and your future. Add a personal 2- to 3-minute video for some extra feels. Offer “mini prizes” for higher donations. For example, you can offer a personalized postcard from your trip abroad to anyone who donates $50 or more, or you can offer a couple of hours of volunteer work to a local organization that they choose. Most crowdfunding sites charge a processing fee for each donation that you receive (generally 8-10%), so if a family or friend says that they donated $50 to your campaign, you may only see $45 in your campaign. With sites like GoFundMe, you may not even notice the fee anyway, but it’s always good to keep that in mind while pushing for extra funding. Finding scholarships is easy, but finding a scholarship that is specific toward studying or interning abroad can be tricky. However, there are resources out there that will be more than helpful in the hunt for free money. Narrow down your interested country selections, unless you’ve been selected into a program already. It would also help if you include your major or type of program you’ve been selected into or are interested in (i.e. marketing scholarships in Barcelona). Utilizing filters will help narrow your options down. Always check the qualifications or requirements for the scholarships. You may or may not qualify for some! Check before applying! You can always check your school’s study abroad office for more resources! Most study abroad offices will have some sort of resource for students to find scholarships or a way to fund money. They also have a lot of useful information on before, during and after studying abroad! Google search scholarships with the country in the search bar (i.e. Chile study abroad scholarships). You should also check country education websites. Some departments of the government offer scholarships or grants for international students. These websites have been helpful in finding scholarships. Another option for figuring out ways to make money to fund your travels is to do some odd jobs or to sell your stuff! I’m not saying sell everything you own or your organs, but to sell things you may not use anymore – clothes, electronics, furniture, old cars, etc. One man’s trash is another man’s treasure. Like always, be cautious when selling things online. Your safety is more important than some dollar bills. Always use your best judgement when making a potential sale. If you’re looking to keep all your things, then we would suggest downloading a variety of apps that allow you to make some quick cash in exchange for some tasks. These apps work around your schedule, so it’s entirely up to you if you want to make money. When using these apps, be aware that they normally have some administrative fees (15-30 percent) that are included in your earnings. It is mainly for your protection – financial and physical – so don’t be alarmed when you don’t receive your total amount. Also, some apps require background checks, which may cost you up to $50, it’s normal! Just remember to be safe and be smart! We’ve been in your position, wanting to travel but funds are low. Instead of pushing those dreams aside, it should motivate you to work hard and to save up for the destination you wish to go to next. Don’t let something as little as money stop you from living your best life. Money will come and go, but you can’t put a price on the memories, the personal growth and the feeling you get when you return from your travels and you feel nothing but absolute bliss. It isn’t impossible to figure out how to make money or figuring out ways to fund your travels. By looking at some of the tips and tricks we’ve supplied you in this article, you should get a head start or at least an idea on what steps you need to take next. If you’ve got the drive, then there is no telling where you’ll go. The cost of traveling and interning abroad can add up, but if you know how to work through the ins and outs of the travel industry, you will be fine. BUT if you don’t have no fear. There are plenty of resources and platforms for you to earn, save and fund your travels! FundMyTravel, the various apps and the many tips and tricks in this article will be your guide to exploring the world. So, let’s start filling up those piggy banks! Want to learn more about our programs and locations? Read about our Program Process. Ready to start the experience of a lifetime? Apply now! Congratulations on making the decision to take on an internship abroad! Whether you’re doing it to gain college credit, gain work experience, or make an impact abroad, this is going to be one of the most memorable events in your life. With the decreasing resources and scholarships available through college, however, more and more of our candidates are searching for ways to afford their program of choice. So many students will not even apply for a program this year due to doubts about getting the funds in time. It’s totally normal to have these concerns, and we’re here to help you! If it can happen to Kristen Wiig, it can happen to all of us. Fortunately, there are plenty of strategies for saving up for your internship that doesn’t have to involve picking up a second job during college. Saving money is a great habit of create during college, but here are some tips to help you grow that savings account to help accommodate for your program! Preparation is essential. Although most internship abroad programs are here to assist you ahead of time, anything can happen; flights can cancel at the last minute, transfers can be missed, and your luggage can disappear. These are things that we don’t necessarily have control over but can always prepare for. You should save more than what you think is enough. Wherever you create your budget spreadsheet (Google Docs or Excel are both a good start), your budget should include the basic expenses. Adelante’s program costs vary depending on which city you want to travel to and how long you want to stay in your program. Check out our Pricing page for more information on this. Your housing expenses are included in your program, whether you choose to stay in a shared apartment or with a homestay family. In some programs, your meals and laundry are also included in the program. Contact us if you have any questions about specific programs and what they have to offer. Your plane ticket will probably be one of your biggest expenses for your program, but Adelante’s team is here to help you find inexpensive flights. Our social media intern searches for price drop alerts with different airlines and sends the information to our team so that we can let our candidates know. There are several websites, such as SkyScanner or JustFly, that help you search for the lowest costs possible. Airport pickup is included in your program fees, so you don’t have to worry about calling a taxi to take you to your housing. In major cities such as Madrid and Barcelona, buses and trains are one of the best ways to commute and travel to different areas nearby. This, of course, will cost extra, and so it’s wise to determine (once you know your housing) the best ways to your internship and to calculate a good monthly budget. This can also include extra trips that you know you’ll be taking on your free time while abroad. Please note that Adelante does not assist with Visas; however, candidates spending less than three months abroad do not need a Visa. Our team is also happy to answer any questions that we can on rules with Visas abroad. Alas, the food. For most of Adelante’s programs, it’ll be up to you to do your cooking and grocery shopping. #Adulting much? Before your program, Adelante sends candidates a pre-departure orientation packet that will include some tips on finding food nearby and how much to expect to spend while abroad. Lonely Planet also has good resources on what to expect to spend in your city of choice. Even if your program offers a couple of meals in your fees, you will still want to save some extra money in case you decide to go out with your new friends abroad or treat yourself to local pastries (because why wouldn’t you?). You *do* plan to have fun while abroad, right? Then you’ll need to save some money for that as well. Some excursions are included in your program fees, and your program director can also help you with finding some of the best deals on trips to other fun spots near your city! You’ll also want to save some money for souvenirs and presents for family, and you’ll want to prepare for some indulgences while you’re there. Once you’ve set up your ideal (and realistic) budget, you want to create a savings plan to ensure that you have the money. The total price of your trip can feel nerve-wracking, but by breaking your savings plan down by weeks instead of months, you can determine what you’ll need to save. This may mean saving 20% percent of every paycheck or making yourself deposit $200 into your savings account each week. Stay consistent with your plan and ask friends or family to help ensure that you’re adding enough money to your savings. There are also several apps and online programs available to help you automatically put money into your savings so that you don’t have to keep reminding yourself. Let’s face it. Most of us in college do not spend money as wisely as we should. The average person between the ages of 18 and 24 spend $400 a month on fast food, takeout, and dining. CAN YOU BELIEVE THAT? Think about how many times you buy new shoes or clothes (or where you get them), or how many times you eat out with friends. Video games are also a major spending issue (unless you’re a famous YouTuber making fast cash off playing them). If you’re serious about saving money and going abroad, perhaps now is a good time to find out where your current cash flow is going. Start shopping thrifty, track all of your expenses, and keep a weekly budget to ensure that you are saving as much as possible for your trip. You won’t only save the money that you need, but you’ll learn great spending habits as well. Look online for apps that track your expenses from your credit cards and banks (such as Mint); that’ll help you start looking at your current habits. Or you know… keep something like this around your house. Stay tuned for Part II, where we show you how to make some extra cash toward your program! Interested in learning more about our internships abroad? Click HERE for more info.